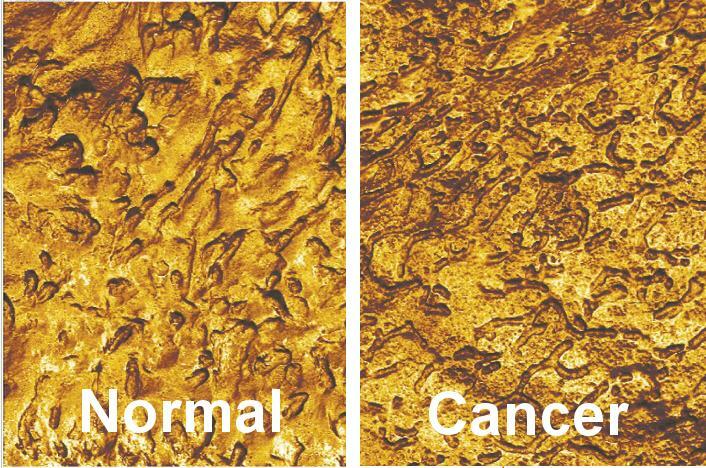 Atomic force microscopy accurately identifies cancer in patients by examining the surface of cells expelled in urine. MEDFORD/SOMERVILLE, Mass. (December 3, 2018) –A research team led by Tufts University engineers has developed a non-invasive method for detecting bladder cancer that might make screening easier and more accurate than current invasive clinical tests involving visual inspection of bladder. In the first successful use of atomic force microscopy (AFM) for clinical diagnostic purposes, the researchers have been able to identify signature features of cancerous cells found in patients’ urine by developing a nanoscale resolution map of the cells’ surface, as reported today in the Proceedings of the National Academy of Sciences (PNAS). Bladder cancer is one of the leading causes of cancer-related deaths in the United States, with the American Society of Clinical Oncologists estimating 17,240 deaths for 2018. While early detection leads to a five-year survival rate of 95 percent, bladder cancer detected at the metastatic stage leaves the patient with only a 10 percent chance of survival after five years. Current methods for detection involve cystoscopy (running a tube with a video camera into the bladder through the urethra), as well as possible biopsy, and pathology examination of the tissue sample. For patients who have been treated and are in remission, the recurrence rate is high – between 50 and 80 percent, so invasive cystoscopy exams must be conducted every three to six months at great expense and discomfort for patients. The diagnostic method incorporates machine learning, enabling a more accurate recognition of the signature surface features, such as adhesion, roughness, directionality, and fractal properties, among others. The AFM-based test demonstrates more than 90 percent sensitivity in detecting bladder cancer (i.e. if a person is known to have the disease, the test will detect it 90% of the time) versus 20 to 80 percent sensitivity for currently available non-invasive diagnostics on urine samples, such as biochemical evaluation of the biomarker NMP22, genetic analysis using fluorescence in situ hybridization, or immunocytochemistry. Specificity of AFM – the accuracy of identifying individuals who do NOT have the disease – is 82-98%, which is comparable to other tests. Other authors of the paper are: Maxim E. Dokukin, Ph.D, post-doctoral fellow (presently a director of research of NanoScience Solutions, Inc.), Vivekanand Kalaparthi, graduate student (currently a research engineer in Micron, Inc.), Milos Miljkovic, Ph.D, former lab manager, all of the Tufts University School of Engineering’s Department of Mechanical Engineering; and Andrew Wang, a high school student who worked at Dr. Sokolov’s lab (and is currently a undergraduate at Harvard University), John D. Seigne, M.D., associate professor of surgery, Dartmouth-Hitchcock Medical Center; Petros Grivas, M.D., Ph.D., associate professor of medicine and director of the Genitourinary Cancers Program, University of Washington; and Eugene Demidenko, Ph.D., professor of biomedical data science, Geisel School of Medicine of Dartmouth College. This work was partially supported by National Science Foundation Civil, Mechanical and Manufacturing Innovation grant #1435655 (I.S. ), and funds from The Prouty Pilot Project Norris Cotton Cancer Center, Dartmouth College. Sokolov, I., Dokukin, M.E., Kalaparthi, V., Miljkovic, M., Wang, A., Seigne, J.D., Grivas, P., Demidenko, E. “Noninvasive diagnostic imaging using machine-learning analysis of nano-resolution images of cell surfaces: detection of bladder cancer.” PNAS 2018 (3 Dec).